You put a lot of time and effort in to generating new business for your company. But is there an easier way? Focusing on new clients is important, but not where all your energy should be focused. Some, if not most, of your time should be spent creating loyalty with current customers so they come back next time. It’s much easier to keep a current client coming back than to discover a new one. That being said, here are 4 simple ways to improve customer loyalty. Greetings. Clients remember the first and last interaction they have with a business, so make it count! Greet your customers with a smile and leave them with a good impression of your business. Satisfied customers are more likely to return. Keep in touch. Consistently (but not constantly!) send emails to past customers. Remind them why they chose to do business with you in the first place. Be careful though – sending too many emails with irrelevant content will cause clients to unsubscribe. Rewards. Make it worth their while. Giving clients an incentive to come back and do business with you will encourage returns. Also encourage clients to spread the word and share their positive experience with potential clients. Reward loyalty and it will continue. Listen. Make sure you know how your client feels during their time with you. Fixing a problem before a client lets them know you care. Reward clients for completing a survey about their time with your business to make sure you understand their opinions. See our blog about creating surveys here! 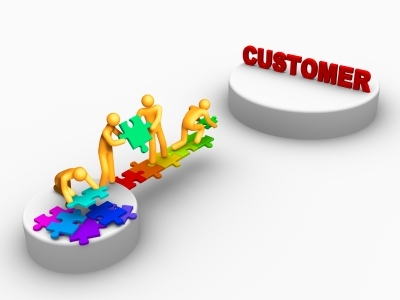 Customer loyalty is a great tool to utilize for your business. With these 4 easy ways to improve, you’ll have clients returning in no time!